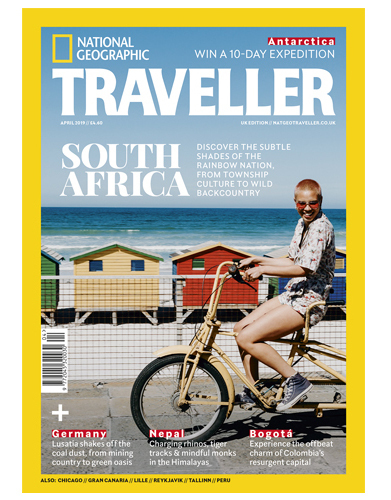 LONDON (7 March 2019) — In this issue we go beyond Cape Town, the Wine Route, and Kruger’s famed Big Five to discover a different side to South Africa. This is a land of lush deserts and magical coastlines, of lesser-known national parks, dynamic neighbourhoods and enterprising locals. We sent two of our writers to the less-visited corners of this vast country, and they’ve come back with stories on everything from pioneering rewilding projects in the Karoo to innovative entrepreneurs transforming Soweto. Don’t miss our guide to a wild weekend break in Paternoster and the West Coast National Park, the coolest spots in urban Durban plus the best beaches for surf and sand. We also reveal the winners of our Photography Competition 2019, in association with Donegal Tourism. This year’s revamped categories span Portfolio, Nature, Cities, Food and People. Destinations: We explore the lofty peaks and valleys of Nepal; discover a green renaissance taking place in Germany; and spend a long weekend in Gran Canaria. Our photo story, meanwhile, highlights Peru’s Sacred Valley. Cities: Our urban stories this issue include Lille, Tallinn, Chicago, Reykjavik and Bogotá. Smart Traveller: Singapore shapes up for 2019; a taste of Sri Lanka; following the chocolate trail on Grenada; the best rooms in Tbilisi; like a local in Brighton; and a trip to Bishop’s Castle. Author Series: Julian Sayarer on Athens. Travel Geeks: Ask the Experts includes tips on house swapping, seeing orangutans and a long weekend in Avignon. Traveller 10: Get to grips with aquatic adventures — we cover everything from kayaking through glacial melts in British Columbia to snorkelling with whale sharks in Indonesia. This press release was distributed by ResponseSource Press Release Wire on behalf of APL Media (Absolute Publishing) in the following categories: Travel, Media & Marketing, for more information visit https://pressreleasewire.responsesource.com/about.